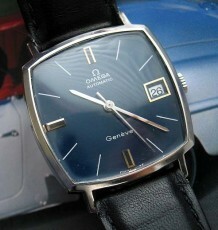 Vintage Omega Seamaster watch, automatic movement. 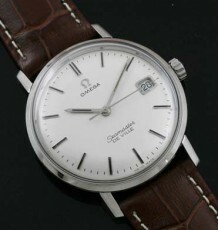 A nice clean vintage Omega Seamaster with an uncommon textured dial. The all original textured dial features a uni-directional linen pattern running from the top of the dial to the botton. 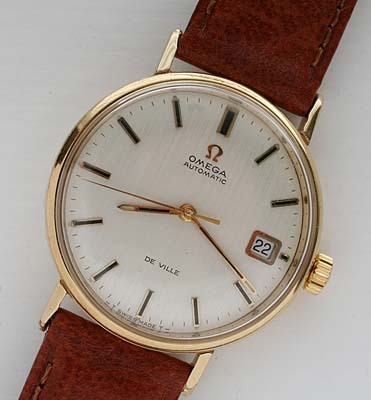 The dial also features raised gold toned markers and hands as well as the Omega logo. The hour markers and hands also have what appears to be Ebony inlays in them. The Omega 24 jewel automatic wind movement, calibre 565 was just serviced by my watchmaker and keeps excellent time. 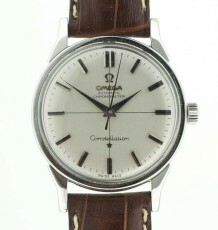 The serial number in the 29 million range dates the watch to 1970. The calibre 565 is a quickset date movement. 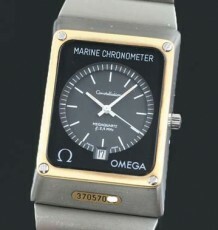 This is another example of a stunning sporty casual watch made by Omega. The watch measures 34.5 mm wide by 41 mm long and will be supplied on the buyer’s choice of black or brown leather straps.